Upon completing "To England With Love," Thorpe realized she had not included the art of heraldry in it. "Pageantry" would be the remedy. She consulted the Oxford Guide To Heraldry which defines heraldry as "...art with special rules and methods, a system of symbols denoting prominent families and institutions, a display of pageantry and an invaluable aid to understanding history and genealogy." 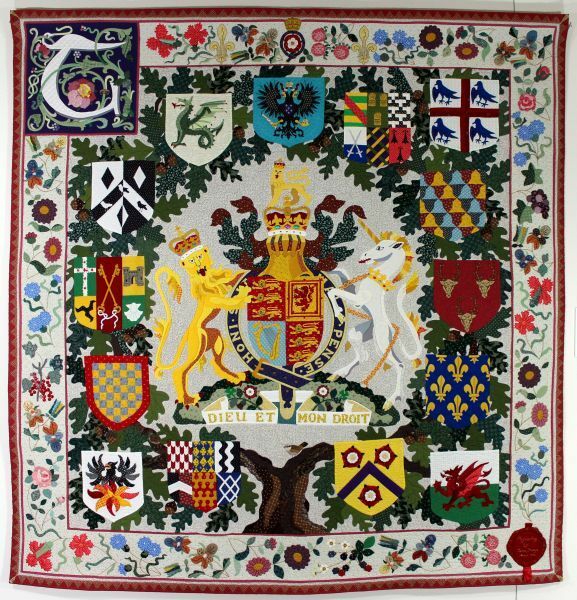 Thorpe began her journey into heraldry by making the British coat of-arms on a 36-inch square which would be the focal point for "Pageantry."